Ultrasonic Inspection is now commonly applied to Mechanized Welded Girth Seams on pipeline construction projects in Canada and it is being widely adopted elsewhere. With recent additions to the type and amount of data collected it has been demonstrated that good confidence can be had from mechanized UT on manually welded girth seams. Code inspection criteria and acceptance criteria must now be addressed to take full advantage of the benefits of mechanized UT. Recent reports ( 1,2, 3) have been generated describing the mechanized UT inspection techniques now used on girth welds fabricated using mechanized welding methods. Since 1993 TransCanada Pipelines Ltd. (TCPL), the largest pipeline company in Canada, has used mechanized UT as the main inspection method on mainline construction for mechanized gas metal arc welding (GMAW). Advantages of the system include speed, accuracy and absence of radiation hazards. With inspection results available readily, the UT system provide a process control for the welding. Not only does the system locate the defective areas along the length of the weld but by means of discrete zone discrimination it can also establish the vertical position and vertical extent of the defect. This latter advantage over radiography permits more precise engineering evaluation as to the seriousness of the defects located (4). This precision of defect location and assessment of vertical extent is the principle of Engineering Critical Assessment (ECA). In 1993, at the same time TCPL was establishing the inspection specification for mechanized girth welds, a demonstration of mechanized UT on manually welded girth seams was carried out. The technique demonstrated was based on the same principles as were used on mechanized welded seams. This involved simply examining the 30 degree fusion face of weld preparations with 60 degree probes. This technique had been acceptable in some European projects but TCPL was reluctant to endorse the technique. They felt that the nature of the manual welding process introduced more off angle volumetric indications which were not adequately inspected with a single angle pulse-echo technique. In the following three years a variety of enhancements were introduced by the service companies (3). These enhancements were combined into a single package and modified for a demonstration on manually welded girth seams during a 1997 winter construction project on a TCPL 42" diameter pipeline. This report describes the techniques and results of the demonstration of capability carried out by RTD Quality Services Inc. (Canada). The probe array is arranged to attach to a welding band used in mechanized welding. This ensures probe position with respect to the weld centreline. Since the welding band is not required by the manual welding process this is an item that must be supplied and installed by the inspection company. As with the mechanized weld inspection system it was decided to divide the weld into several vertical zones and use a series of pulse-echo probes with their beams positioned to intersect the weld bevel centred on each zone. (See Figure 1). Recently incorporated "mapping" or colour B-scans, to characterize porosity and geometric origins of signals was also used. A significant addition to the techniques was time of flight diffraction (TOFD). These two enhancements provided the much needed confidence to detect off angle and volumetric defects. TOFD also added the ability to improve defect sizing and assessment of mismatch (high-low). However, the great advantage of TOFD to detect defects near the inside surface is reduced when pipe mismatch occurs. Also, due to the ring time of the lateral wave the upper 4-5 mm cannot be thoroughly inspected by TOFD. For these reasons standard pulse-echo techniques are retained. The ability of TOFD and the low amplitude B-scan mapping to assist in evaluation can be seen in Figure 4. An example of the monitor display of a "wagon-wheel" defect (parallel elongated slag inclusions) illustrates the ease with which an operator can now make evaluations. The upstream (left side) of the Zone 4 strip charts and B-scan mapping show only weak signals originating from the flaw where partial remelting has reduced the flaw volume but the downstream side indicates a strong reflection from Zone 3. Highlighting the transit-time (grey shading on the analogue-type strip chart) by changing its colour to red, allows the operator to move to areas exceeding the evaluation threshold for a distance exceeding the minimum acceptance length of a defect (also shown in Figure 4). The RotoTOFD option can be configured to be scrolled on one side of the display as in Figure 4 or a simple toggling can zoom the TOFD image to about four and a half times the normal size and position it mid screen between the strip chart image to facilitate quick sizing by better display resolution of the waveform. Figure 5 allows the operator to determine that the defect in question initially occurs 3.5mm from the ID surface. (Figures 4 & 5 are from scans of test welds in 16.0mm wall). The single greatest advantage of TOFD is its ability to provide accurate vertical extent of a defect. Accuracies of 0.1 to 0.2 mm are possible using some TOFD techniques. This could greatly extend allowable defect lengths in Engineering Critical Assessment calculations when applying the code. In the trials on the 42" diameter pipe no ECA had been developed but reasonable confidence was had that a minimum defect height of 2mm could be assessed. This limit would apply to the pulse-echo channels for the near OD and for the ID where significant mismatch would be present, however, much finer vertical resolution could be had for TOFD detected indications. Codes such as API 1104, API RP2X, CSA Z184 and ISO/CSA Z662 provide "workmanship" acceptance criteria for radiography. Although provisions are made in these codes for ECA's to be used to establish longer defect lengths, few companies elect to use them or their customers do not permit the use of an ECA but insist on workmanship criteria because the radiographic acceptance is the only thing they feel comfortable or familiar with. Some rationalize workmanship is "more stringent" (so they think). However, it is well understood by most engineers (4) that repairing a small defect can be more detrimental to the strength of the metal than leaving the benign flaw in the weld. The repair can introduce other non-detected flaws, and the added heat input extends the heat affected zone thereby locally reducing the fracture toughness of the metal. Table 1 shows a comparison of allowable defect lengths for workmanship and a typical ECA using some API 1104 criteria. This shows how the number of repairable indications could be reduced by knowing the maximum vertical extent of a flaw. (All units in Table 1 are in inches). Ongoing efforts have provided the increased confidence in the mechanized UT of girth welds to the point where it can now be recommended for application to non-mechanized welding techniques. With more information now collected, including information that can detect off-angle planar and volumetric flaws, evaluations are more reliable for defects intrinsic to the manual welding process. A review of radiographs versus UT results for the welds tested in the 1997 Canadian demonstration presented impressive statistics. All significant indications identified by radiography were detected by UT. TCPL requires maximum radiographic sensitivity as afforded by Class 1 film used in conjunction with true radial beam X-ray tubes. In spite of this high sensitivity, there were examples of nonfusion detected by UT could not be seen on the high quality X-ray radiographs. Daily operating costs of mechanized UT that should not be significantly higher than radiography. However, several cost advantages could be realized by using UT. 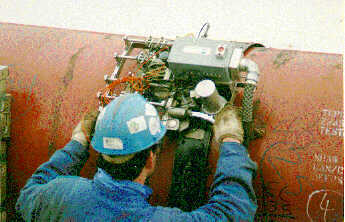 Time of inspection is reduced, process control is possible, vertical sizing is possible, ECA criteria can be applied allowing longer flaws therefore fewer repairs, a single UT crew dedicated to tie-in weld inspection can provide the production capability of two or three radiographic crews and avoid radiation hazards, in tie-in applications results of inspection are available faster so welding crews can be freed up sooner to move on to the next tie-in location. The system demonstrated was used on production mainline welds, however, it is intended to be used on manually welded tie-in joints in ditches and the potential exists to apply the technique to field fabrication in stations thereby allowing inspection and welding to go on beside one another without the stoppage in production or re-scheduling of inspection required when radiography is used. Tie-in delays of three to four hours for large diameter welds now shot with radiography could be reduced to less than 15 minutes. The many advantages of UT must be quickly addressed by Codes now dominated by radiographic inspection acceptance criteria. Users (owners and construction companies) should also take the initiative to utilize the combination of Ultrasonic testing with an effective ECA. The authors would like to thank RTD Quality Services Inc. (Canada) for the images provided. The authors would also like to thank TransCanada Pipelines Ltd. for their ongoing efforts to promote ultrasonic inspection in the pipeline industry. R. Denys, Defect Acceptance Level for Ultrasonically Inspected Girth Welds, University of Ghent (Belgium), 1995, unpublished document. 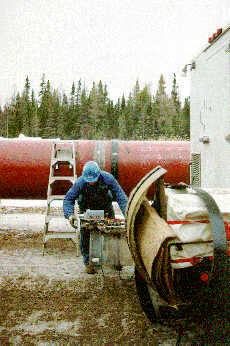 Merv Hoff is the senior NDT coordinator for TransCanada Pipelines. Peter den Boer is manager of Automated NDT inspections for RTD Quality Services Inc.
Ed Ginzel is an independent consultant with the Materials Research Institute.